The Red-faced Parrot (Hapalopsittaca pyrrops) has seen its population decimated by habitat loss because of slash-and-burn agriculture. Outcomes: The Parrots in Peril team learned that the range for these species, including the Red-faced Parrot, is larger than previously thought. 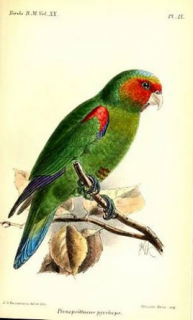 This critical work also underlined the importance of Podocarpus National Park for the other threatened species, the White-breasted Conure (Pyrrhura albipectus) and the Golden-plumed Conure (Leptopsittaca branickii). The team also judged the Red-faced Parrot to probably be the rarest parrot in S Ecuador. Where found: Found on the slopes of the Andes in N Peru and S Ecuador. History: The Red-faced Parrot, Hapalopsittaca pyrrhops, is found only in the E Andes in S Ecuador (Morona-Santiago, Azuay and Loja) and ranges of NW Peru (Piura and north Cajamarca [I. Franke per J. Fjelds in litt. 1999, J. P. O'Neill in litt. 1999, Schulenberg et al. 2007]). An estimate of suitable habitat suggests that its total range is likely to be about 9940 km2. Due to habitat fragmentation and destruction through slash-and-burn logging practices the Red-faced Parrot's population numbers only in the few thousand. Ecology: The Red-faced Parrot is found from 2400-3500m (7872-11,480 ft). It inhabits wet upper montane forest in the temperate zone including mossy growth areas, open woodlands and shrubbery, and is reported in fragmented forest with varying degrees of degradation, even tolerating secondary forest. Birds feed on fruits, berries, shoots, flowers, seeds, pods and parts of two Ericaceous trees. They are gregarious, and seen in flocks of up to 20 birds. Birds stay to one area, with movements to other places in response to food availability.